Located at the Indianapolis Public Library’s Library Services Center, 2450 N. Meridian St., (approximately 24 blocks north of downtown). Visit the Indy Library Store, the sales outlet for the Indianapolis Public Library, and talk with staff about bookselling strategies and the benefits and challenges of operating a book-selling business. 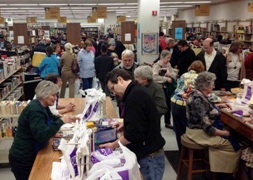 Observe a large scale traditional book sale and take a look at the Internet sales rooms. If you or your Friends organization have been thinking of trying Internet selling, Library Store staff can share their experience and success with you and help get you started. All discards from the library’s collection and all donations are collected at one site where the staff (employee and volunteer) sort and shelve approximately 750,000 items each year. Most are sold in large public sales held quarterly. These sales have generated several million dollars revenue since they began in 1986. Library Store began selling on the internet in 2001 when Amazon first opened its site to third party sellers. Amazon is the primary outlet with the largest inventory, 6,500 items. Abebooks is the venue for antiquarian books with 1,200 titles. An eBay store offers 400 items plus an always changing assortment of items at auction. Revenue from online sales has increased rapidly over the last several years and this year will reach $120,000+.